Papua New Guinea has a fearsome reputation – stories of sorcery, tribal warfare and cannibalism are plentiful. It’s definitely not your average tourist destination. So, what made Ian Lloyd Neubauer want to motorbike across it, on a second-hand bike? We spoke to Ian to hear more about his trip and his get his biker’s guide to Papua New Guinea first hand. The way I see it there’s the world, and there’s PNG. No matter where you’ve been, no matter how far you’ve travelled, you will never see or experience the kind of stuff you can see and do in PNG. 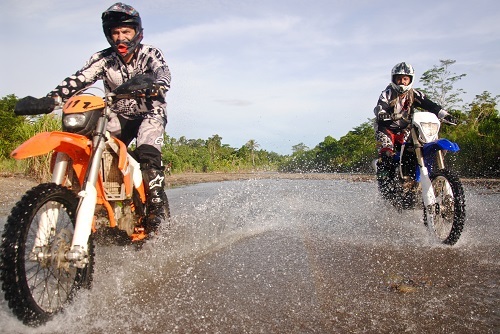 Motorbiking isn’t a popular pastime in PNG, bikes have never really arrived in the country. Any that are there have been imported over from Australia so are usually second hand and can be quite battered. Even though PNG is about the same size as Thailand, it only has about a dozen highways. And even then, they are not in great condition and lethal on a bike. There is no road, linking the capital Port Moresby to the second largest city Lae, because there’s a Himalayan-size mountain range called the Owen Stanley Ranges sitting between the two cities. Even the Swiss couldn’t build a road or blast a tunnel through it. So what that means is that most of the time, commuters have no option but to ride or drive on dirt roads, fire trails, single-tracks, machete trails or even straight through the bush or through shallow rivers. And this is exactly what I ended up doing too. Heading towards the mountains from the capital, we exited the highway and plotted a backcountry route that wound far too tightly between pine trees for anyone to relax. I worked every muscle in my body to navigate the 107kg bulk of my Honda CRF450 around ruts, logs, fallen trees and over hills. I fell behind so many times, unable to keep up with my friends – those local guys just had a knack for ducking branches I didn’t seem to have! 2 hours of cramps, stress and rough and tumble later and the jungle finally spat us out at the Kundiawa township we were aiming for. It’s not easy riding but it’s certainly rewarding. Those kinds of rides give me serious respect for the locals – PNG is a tough place to live and work in and these guys have to undertake arduous treks like that every day. But the people who live in PNG are wonderful, kind, generous people who get on with their lot when a lot of other people would complain and give up. 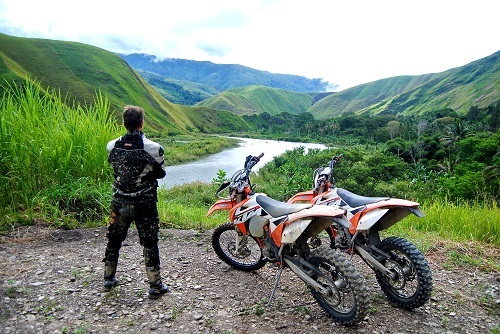 One of the craziest things you can do on a bike – and especially in PNG – is hillclimbing (off-road motorbiking where you try to ride up increasingly steep hills until you make it to the top or hurt yourself or stuff up your motorbike trying). We decided to try to hillclimb up Lake Wanum. Nobody has yet managed to hillclimb to the top of the largest hill on the Lake so we were desperate to give it a go. Unfortunately – not even the locals managed to navigate through the three-metre high elephant grass and we never made it to those hills. But turning back to head home we found a group of massive hills to climb that overlook the lake – almost the same. My first attempt at a hill climb ends with the front wheel of my motorcycle going over my head, my face in the dirt and my mates laughing their heads off. But I lose my inhibitions on my second attempt, accelerating hard on the incline until I reach the top. From there we zoom down the back of the same hill before shooting up a second hill and a third and a fourth and so on and so on like crazy kids on a self-drive rollercoaster until we reach the highest peak in the cluster. There we can see all of Lake Wanum and the super-steep hill that is yet to be conquered on a motorbike. Trying to describe PNG in a meaningful way is an exercise in frutility. If you want adventure – real adventure, a journey without a predetermined conclusion – if you want to be challenged, psychically and mentally, if you want to meet strange, wonderful, kind, generous people, then do yourself a favour and check out PNG. You won’t regret it and you’ll never be the same after you leave. And like so many others, you’ll probably find yourself going back again and again and again. Because compared to PNG, every other place is just that – a place. PNG is something else. Click here to read more about Ian’s trip. 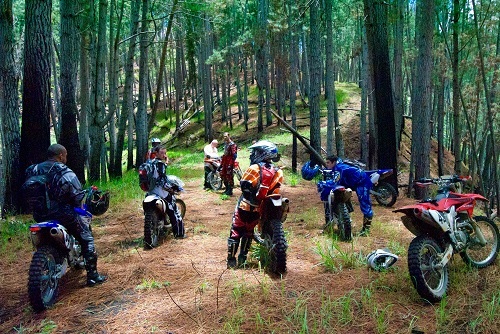 This entry was posted in Land Sports, Travel and tagged Biker, Biking, Papua New Guinea. Bookmark the permalink.